Earn more in your lifetime. Earn more, right now. Negotiate without fear to get what you deserve. Learn to counter the tricks employers use on you to keep your pay lower. Impress your company without losing the offer. That means most people are losing over HALF A MILLION DOLLARS in their lifetime, all because of an unfounded fear of negotiating. After learning this, I sought out to discover how the experts do it. This book is a collection of my lessons learned from negotiating several salary increases throughout my career and from helping family and friends do the same. We ended up being PAID MORE, while being MORE RESPECTED by our employers for the value we brought to the company. Find out why you shouldn't fear losing an offer or your job by simply asking for a raise. Learn the strategies and tactics behind all negotiations so that you can adapt to any situation. "In their paper researchers found that employees who negotiated their salary boosted their annual pay on average of $5,000." "I was one of the lucky few that read this book before it was released, and what a gift. 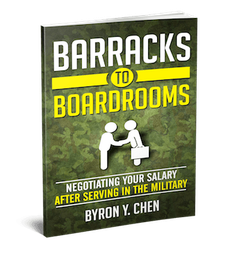 Even though I have been out of the military for two years when I read the book, I was facing a tough bonus and commission negotiation for a partnership I was about to join. This book was invaluable to me during the negotiation process. Highly recommended to anyone facing any sort of negotiations." The book takes research-backed strategies and tactics developed by experts and professionals and explains them in real world scenarios. 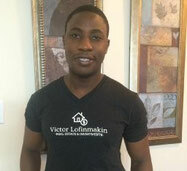 I've helped people negotiate with Fortune 500 companies, small businesses, and industry leading employers. The book teaches a systematic process to help you evaluate your compensation package, figure out where you add value, and determine how to communicate it skillfully to persuade your employers. Take control of your career and negotiate the way other professionals do to be compensated at top of the industry rates. You owe it to yourself. Get over your fears, overcome your doubts, and learn the skills you need to get paid what you deserve. 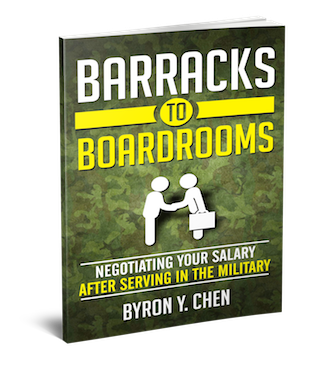 Get the book that teaches veterans how to negotiate the salary they deserve!